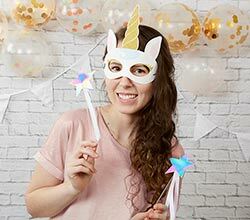 Hosting an enchanted birthday party, baby shower or bachelorette party? 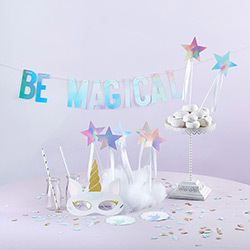 Then like the included banner says, it must "Be Magical," and our Enchanted Unicorn 49-piece Party décor Kit can help. 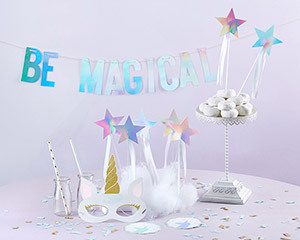 Filled with everything you need to transform an ordinary party to a magical, unforgettable experience—including iridescent star wands, unicorn face masks, coasters and straws. The only thing left to create is the guest list! 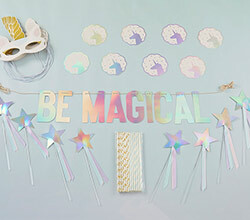 Thick iridescent paper cutout letters spelling out "BE MAGICAL"
White cardstock coaster with a scalloped edge. The edge, unicorn and stars on the coaster are iridescent.